For years now I have been fascinated with how photographers examine their/our personal relationship to food and its production through art to comment on how we as a society interact with what we eat. I started examining this imagery and my own personal relationship with what I consume in Fraction Magazine years ago in The Un-Natural Nature of Food. This curated online exhibition focused on how many in contemporary society cultivate, raise, hunt and forage for what they consume through indirect and direct means. I included the work of Brian Ulrich, Colleen Plumb, Dan Nelken, Jake Chessum, Susanna Raab and many others whose images or entire projects have considered the chasm that separates many of us from what we eat. Photography, along with the numerous books and documentaries on the subject, was a catalyst for me to further consider what I consumed and how I consumed it. In contrast to the somewhat aggressive and political work I chose for the Fraction exhibit, two recently published projects, Bernhard Fuchs' Farms and Taj Forer's Stone By Stone, take a more subtle approach to the subject of food production and our relationship to the resources of the land. 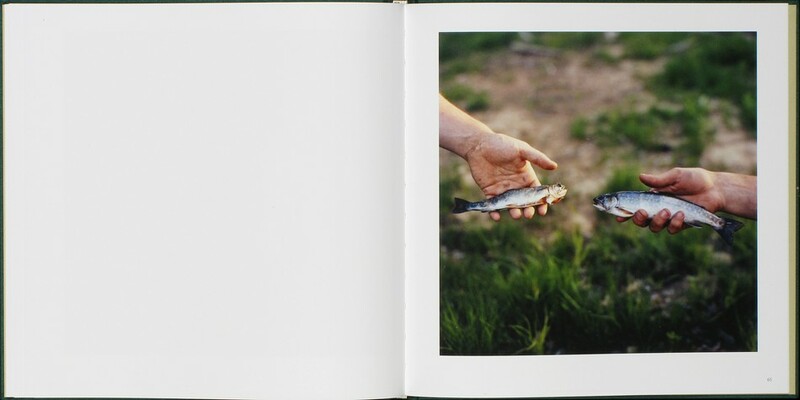 Farms features images from many of the agricultural regions near Bernhard Fuchs' birthplace in Helfenberg, Austria. The cover is unassuming with linen wrapped boards and earth toned embossed text. Upon opening the book, Fuchs (and his designer) takes us for a walk in the Austrian countryside to see fallen fruit in an orchard near Piberschlag, a pitchfork resting against a plastered wall in a fodder store (the building for storing dry food to feed cattle) in Thurnerschlag, a white and weather-stained farmstead in Herrnschlag. Fuchs notes that the region's 'climate is bleak' and all of the photos displayed benefit from the seemingly numerous overcast days. Fuchs' photos lack animated life - he shows no humans or animals in the photos and images are mostly devoid of vibrant colors. He reminds us briefly in his afterword that the family farm is losing to regulation and urbanization. Fuchs' images question the growing state of disuse of this land with a light-handed and nostalgic aesthetic. The images and book, beautiful and unassuming, add to Fuchs' theme of meandering journeys previously presented in the projects Roads and Paths and Streets and Trails. Taj Forer's work in the book Stone By Stone is like Fuchs in that he often chooses to capture his images on the overcast days: the days we are most in need of shelter, days that remind us that winter, if not here, is on its way. 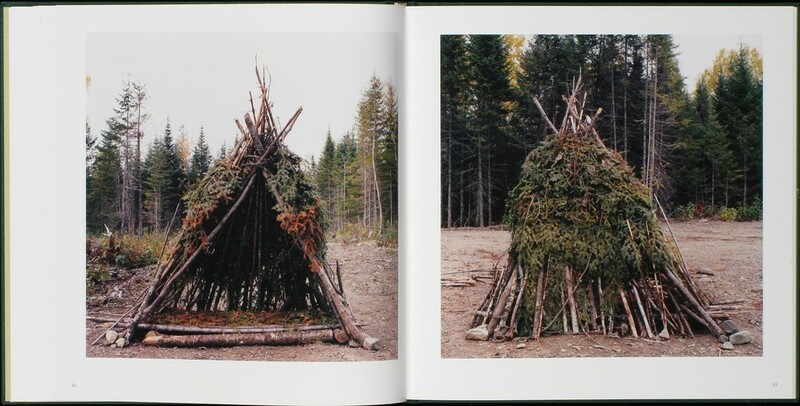 Unlike Fuchs, whose images are more of a meditation on the land, Forer is creating a visual how-to-manual: this is how I do it; this is how I keep the cycle going and make use of the resources I have. Forer presents a photographic exploration of how we interact with nature to supply us with the basic necessities - food, water and shelter. 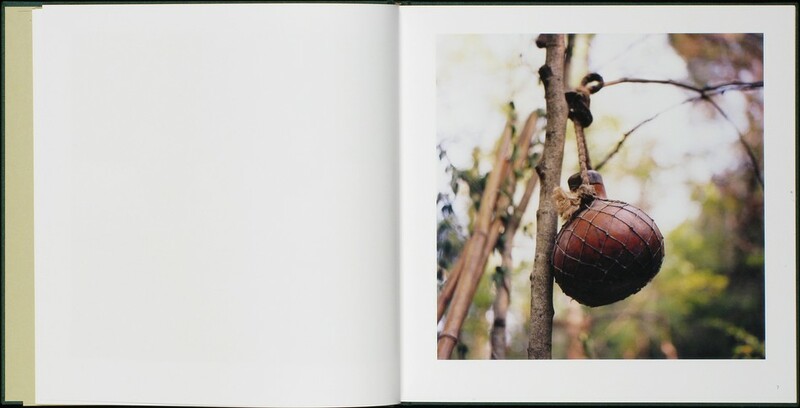 He shows us images of the life of a hunter/gatherer - his mud and straw structures, a tinder nest and grooved fireboard, a hand reaching for the foraged apple, a gourd canteen, and a pelt contrasted against the white tent wall. The debossed cover image shows foraged Jerusalem artichokes supported in a bed of pine needles, an image that fully represents the idea of living off the land with each of the materials supplied by nature. Many of Forer's self-made structures remind me of Edward Curtis' images of Native American structures like the primitive Apache hut image from 1903 - the continuation of a cycle of living off the land. Forer is documenting his experience of reconnecting with what has always surrounded us. It is an art book with intent and purpose carefully and lovingly produced by Forer with the publisher Kehrer Verlag. Forer was able to oversee the printing with the help of an AOL grant. Watch the grant follow-up video to hear more about the project in Forer's own words. The messages in Forer and Fuchs' books are not blatantly about the evolving nature of agriculture and human sustenance, but undertones relating to this theme are present in both. It may sound like a heavy subject, but neither artist is proselytizing with the work, the images produced in the both books are light and meditative. The books physically match in weight, both measuring approximately 10x10 inches and around 100 pages and would fit well into the shelves of a consciously-minded foodie, food activist or art book collector.